The Hispanic Mentoring Program is designed to encourage, engage and sustain greater numbers of Latino children, and recruit volunteers and families to join in. Hispanic Mentoring provides Latino children with a caring Big Brother or Big Sister that can enrich their lives culturally, socially and academically, and support them reaching their potential through one-to-one mentoring friendships. 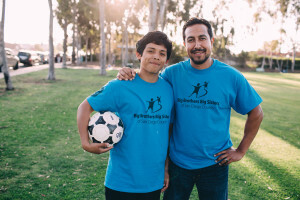 Big Brothers Big Sisters of San Diego County has embraced the Hispanic Mentoring Model that we have locally named Hermandad, which means Brotherhood and Sisterhood in Spanish. Hermandad will continue the Big Brothers Big Sisters tradition of outreach to all at-need youth through the recruitment of Latino volunteers to mentor Latino Littles. Hermandad is a response to the large increases in the Hispanic population and the rise in childhood poverty for Hispanic children, whose families were hit hardest by the bleak economy. Latinos make up more than 16 percent of the nation’s population, according to the U.S. Census Bureau. The nation’s under-18 population would have declined over the past decade if it weren’t for Hispanics. “How Latinos mature, what schools they go to and how they do in the labor market will have implications for us all in this century,” said Mark Lopez, an author of the Pew study. “A quarter of all children are Hispanic, and in the future they will make up a greater share of the nation’s workforce.” Therefore, Big Brothers Big Sisters is committed to serving the needs of Hispanic children and families in San Diego. The mission of Hermandad is to help Hispanic children reach their potential through professionally supported, one-to-one relationships with measurable impact. It continues the Big Brothers Big Sisters tradition of outreach to under served youth by focusing on the connection with Hispanic communities and the recruitment of Latino Bigs in one-to-one relationships with Latino Littles. A BIG thanks to The Jack in the Box Foundation for generously providing the funding needed to launch this initiative in San Diego County.